There are many different terms for single cats, groups of cats, and cats of either gender, ranging from the scientific to the colloquial. The following are descriptive words for felines. Clowder/Clutter: Either term can be used for a group of cats (see Names for Groups of Animals for a full list). Felidae: This term encompasses the entire family of cats, both wild and domestic, including big cats such as tigers and cougars. Kindle: A kindle is a group or litter of kittens. Dam: A dam is a mother cat with a litter (also referred to as a Queen). Queen: Female cats were first described as queens in England by breeders, most likely as a joke, and possibly in recognition of the fact that cats are matriarchal. The term eventually became the standard descriptor for breeding females. Tom/Tomcat: The use of tom for unneutered male cats originated with a book called The Life and Adventures of a Cat (1760) that detailed the exploits of a promiscuous feline hero named Tom (authorship of the book is unknown, but has been variously attributed to Henry Fielding or William Guthrie). This book also gave rise to other slang terms, such as “tomcatting” to describe promiscuous human male behaviour. Prior to The Life and Adventures of a Cat, male cats were called rams. Stud: A stud is a tomcat used in a breeding program. Domestic/Random-Bred: A domestic is a cat that lacks a pedigree, although the term is frequently used to refer to any member of the Felis silvestris catus species. Felid: A felid is any domestic or wild cat. Felis silvestris catus: This is the scientific name for a domestic or purebred cat. Feral: A feral is a cat that once lived with people but has subsequently became homeless, or a domestic cat that was born wild. Meezer: This is an affectionate term for a Siamese cat. Moggy: Moggy is used in the UK to refer to cats of mixed breed or unknown ancestry. Odd-Eyed: Odd-eyed cats have eyes of two different colours. This trait is often found in white cats that have one blue eye and one eye of another colour. 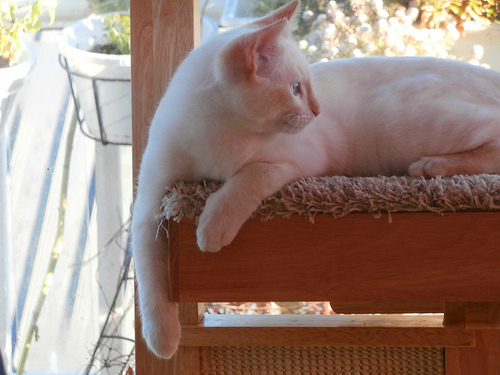 More than half of all white cats with two blue eyes are deaf in both ears, whereas in odd-eyed white cats, deafness usually only afflicts the ear on the blue-eyed side. Polydactyl: A polydactyl is a cat that has additional toes. Purebred: To be called a true purebred, a cat must have two parents of the same breed and also of unmixed descent since the breed was first recognized (though certain outcrosses are permitted for some pure breeds). Wild Type: The wild type is a natural pattern rather than one that arose via selective breeding (for example, the brown-striped, shorthaired tabby).